Russian President Vladimir Putin accused “powerful” forces within the United States of trying to sabotage ties between Moscow and Washington in the wake of a controversial summit with US counterpart Donald Trump. Addressing Russian diplomats in Moscow on Thursday, Putin described his meeting with Trump earlier this week as “successful”, but warned relations between the two countries remain in “an extremely unsatisfactory state”. “In many respects, [Russian-US relations] are even worse than during the Cold War,” said Putin. 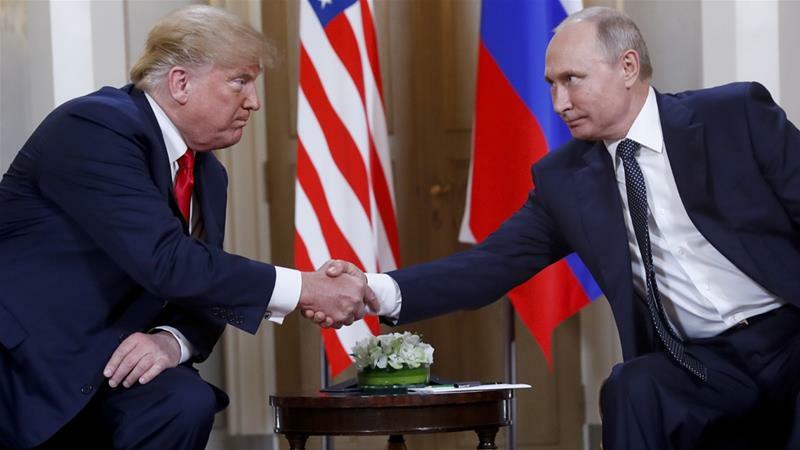 Trump has faced widespread domestic criticism in recent days following the summit in the Finnish capital Helsinki on Monday, most notably over an initial refusal to blame Russia for meddling in the 2016 US presidential election. The US president later claimed to have misspoken and said he accepted the US intelligence community’s conclusion of Moscow’s interference. US intelligence agencies allege Russia did make a concerted effort to meddle in the vote, a charge Moscow has repeatedly denied. An investigation into possible interference by American special counsel Robert Mueller, part of which is focused on whether there was any collusion between Trump’s campaign team and Russian officials, is ongoing. In a series of tweets on Thursday, Trump accused the “fake news media” of pushing US confrontation with Russia, adding “they … hate the fact that I’ll probably have a good relationship with Putin”. Trump also described the summit with his Russian counterpart as a “great success”, at which “terrorism, security for Israel, nuclear proliferation, cyber-attacks, trade, Ukraine, Middle East peace, North Korea and more” were discussed. He said he looked forward to a second meeting with Putin to tackle the issues. Trump and Putin praised US-Russia military ties at the joint press conference following their summit, and mentioned the possibility of greater cooperation in the seven-year war in Syria that has killed about half a million people. On Thursday, General Joseph Votel, head of US Central Command, told reporters he had received no new guidance regarding US military strategy overseas as a result of the Helsinki meeting. “For us right now, it’s kind of steady as she goes. We have received no further direction than we’ve currently been operating under,” Votel said, adding any move towards possible coordination between Russian and US forces in Syria would need to be approved by Congress. Meanwhile, Russia’s envoy to the UN said on Thursday the Helsinki summit would “positively affect efforts to resolve the Syrian conflict”. What’s the legacy of the Trump-Putin summit? Next article Why are Iraqis protesting? Putin warns against ‘losing cool’ on North Korea.